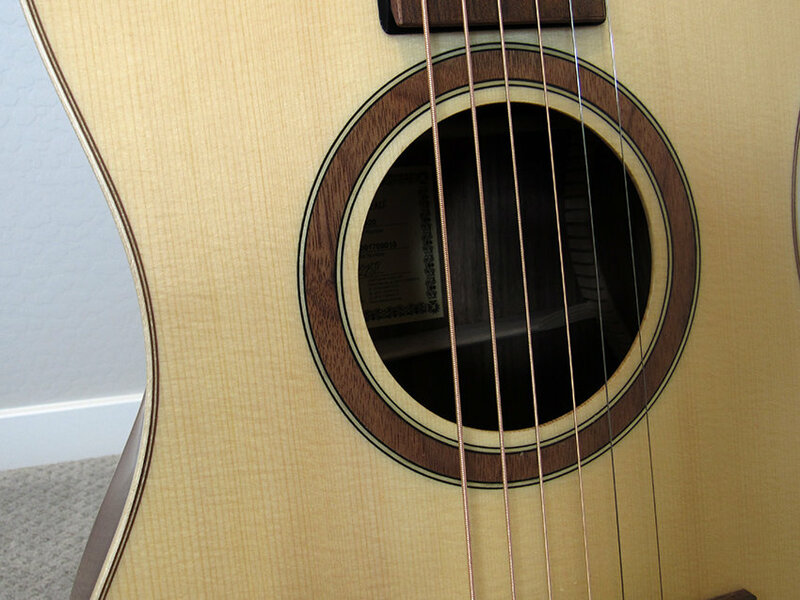 Awhile back, I compared 3 acoustic travel guitars. 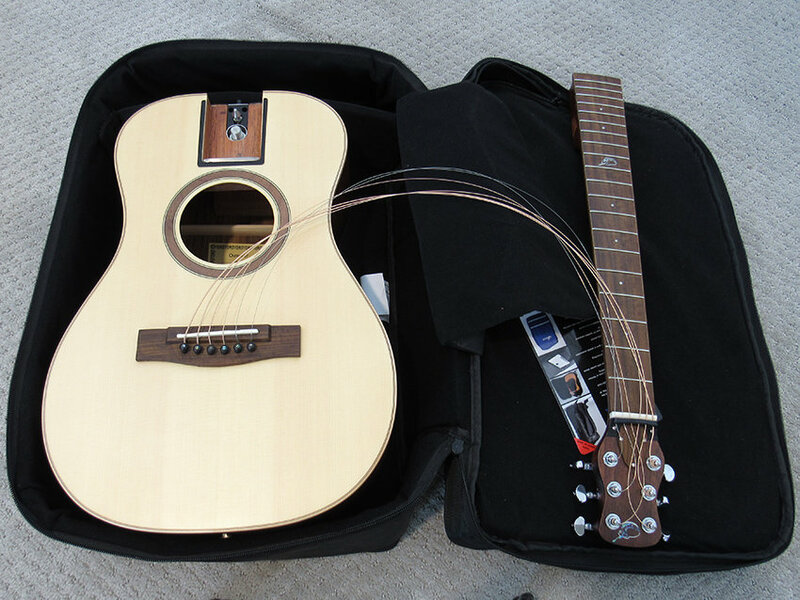 More recently, Journey Instruments was kind enough to loan me one of their OF420 acoustic-electric travel guitars to review. The most unique feature of these models is that they’re collapsible, thanks to a detachable neck. The body of the guitar is also a unique wedge shape, but I’ll go over all that and more in this review, so read on! 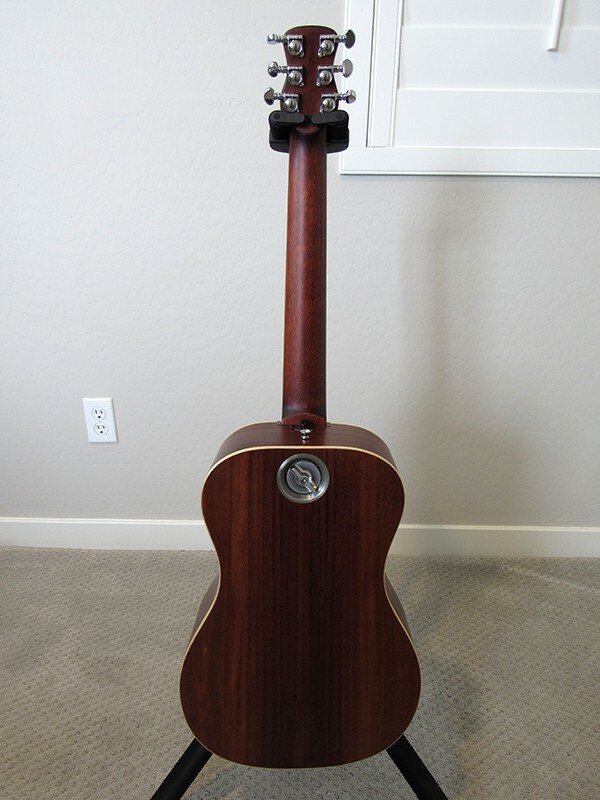 Essentially, the Journey OF420 is a high quality, all wood, acoustic-electric travel guitar with a detachable neck. 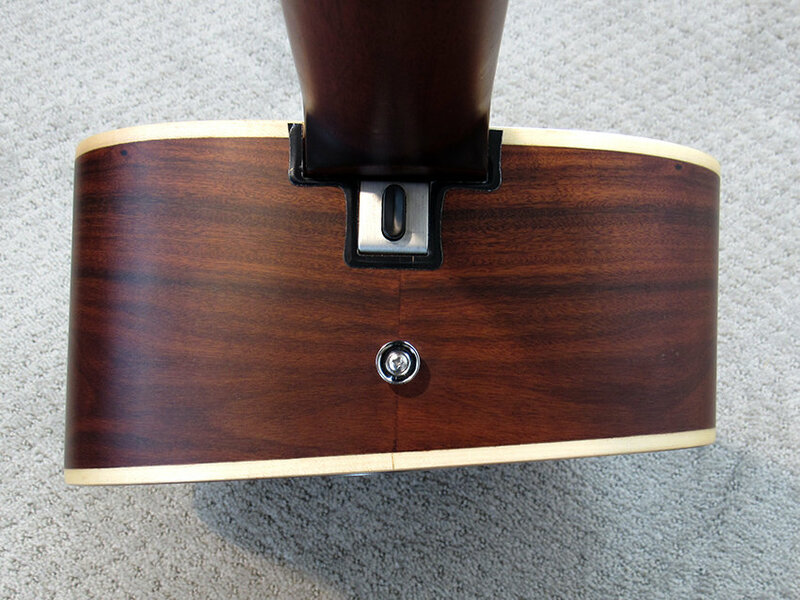 The unique neck mechanism allows the the guitar to collapse down to a size small enough to fit in the overhead compartment of most (if not all) airplanes. 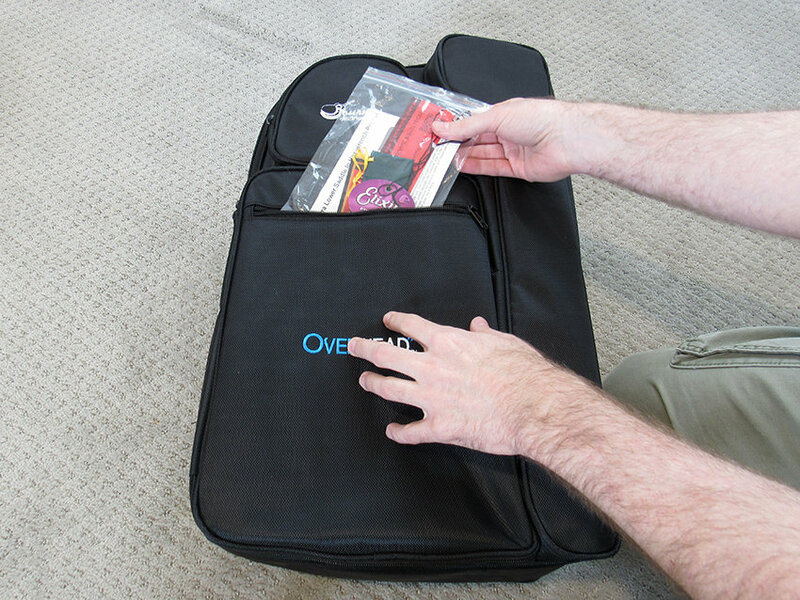 The included gig bag is roughly the size of a very large backpack, and provides extra storage for other items you might need on your trip. 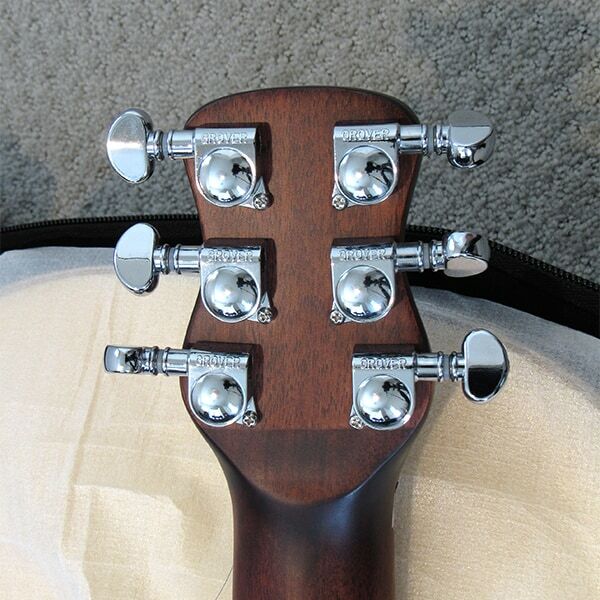 I wasn’t able to find many acoustic travel guitars in this price range that featured detachable necks. I uncovered a couple high-end/custom builders that offer this feature, but that wouldn’t be a fair comparison. Those guitars have a much higher price point and are a bit harder to get unless you’re willing to place a custom order and wait weeks or months for delivery. 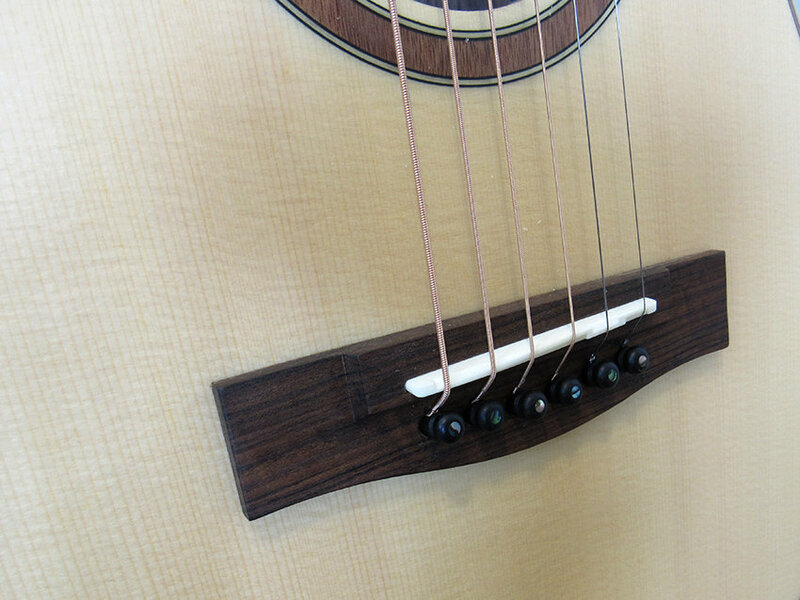 The KLŌS carbon fiber travel guitar also features a detachable neck (read my review here). 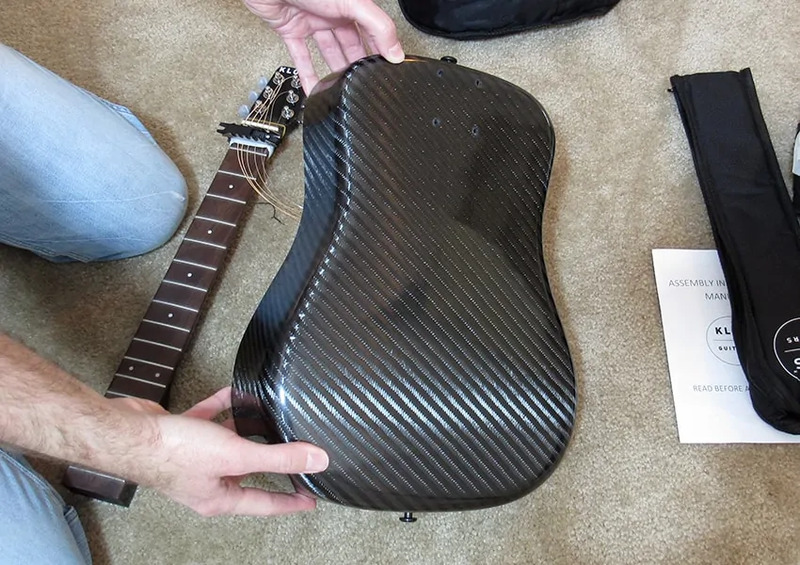 The closest “competitor” I could find is a guitar I reviewed in my other post: the KLŌS Carbon Fiber guitar. However, it’s not really a fair comparison because, in addition to a carbon fiber body, the KLŌS is a very different guitar in many ways. 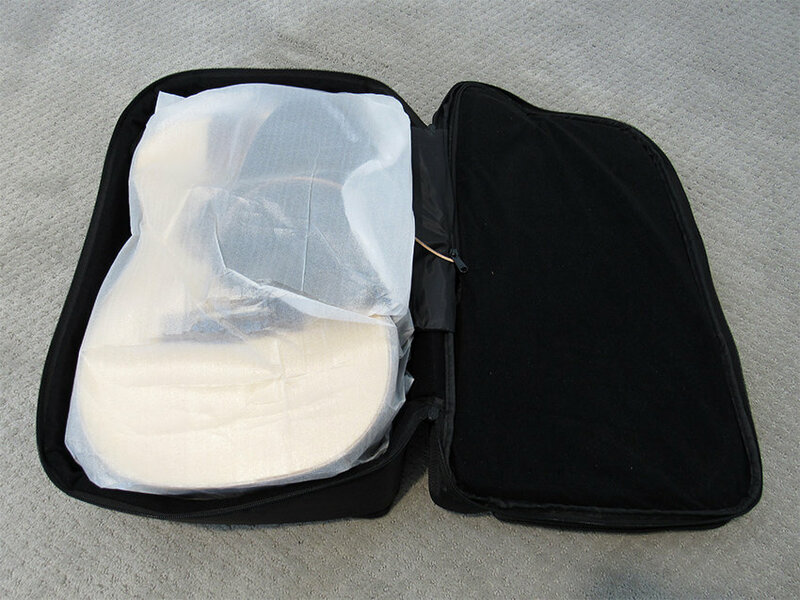 Regardless, I encourage you to check it out if you’re looking for a collapsible travel acoustic guitar and want to do a little comparison shopping. When your OF420 arrives, a few extra goodies come with it, such as a gig bag that can be converted to a backpack, an extra “lower action” bridge saddle, and a truss rod wrench. The OF420’s gig bag is about the size of a camping/hiking backpack. 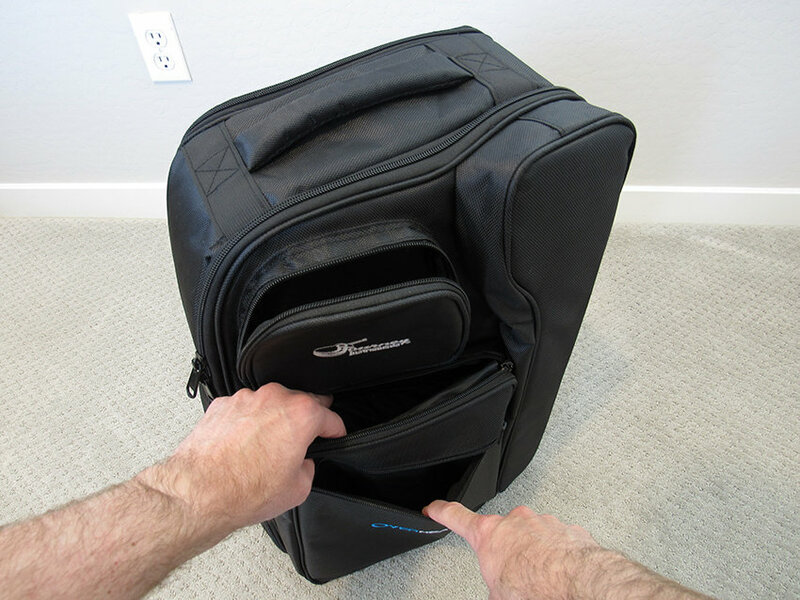 It has two carrying handles–one on top and one on the side. 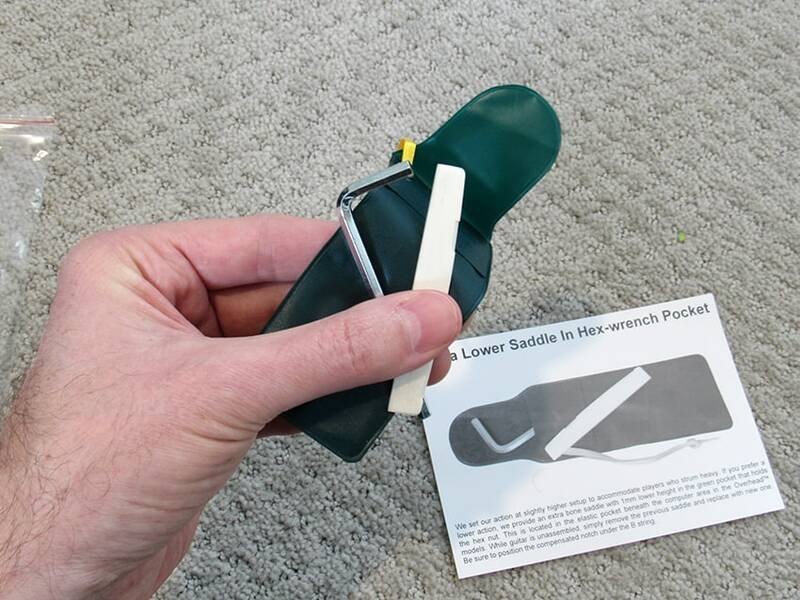 Or, you can opt to instead deploy the backpack straps, which are normally tucked away neatly in a pouch. 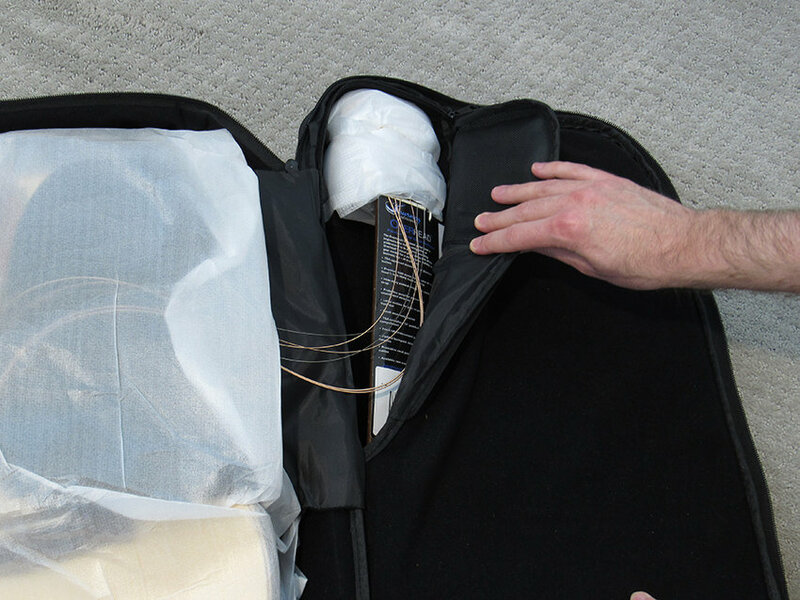 There is a separate, isolated compartment for the neck and a “string flap” inside the bag. 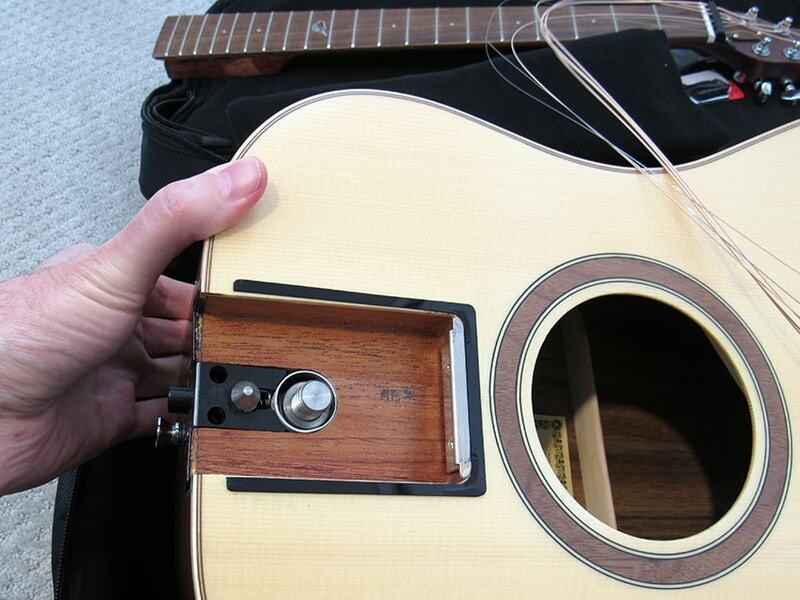 These features prevents the strings or neck from contacting the guitar’s body while in storage. Lots of external pockets provide extra storage for accessories. Extra pockets for storage of accessories or a spare pair of clean underwear. The body and neck are kept separate so they can’t scratch each other. 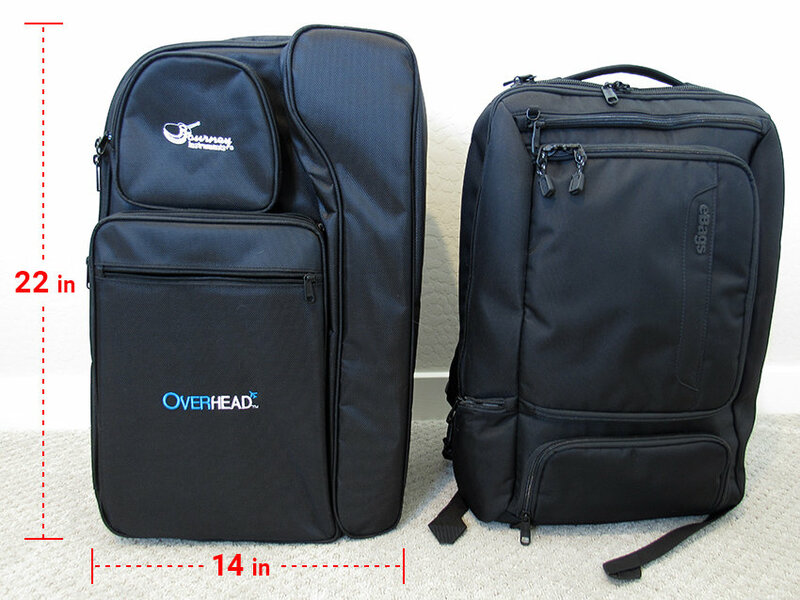 The gig bag (left) shown next to my larger-than-average-size backpack (right). I was pleasantly surprised to discover that the Journey OF420 comes with an extra “lower action” saddle. The standard saddle gives an action that is quite high–too high for my wimpy fingers (I rarely play acoustic), so this was a welcome accessory. The guitar also comes with a truss rod wrench. This was a nice surprise: Journey includes a “lower action” saddle that instantly lowers your action about 1mm. 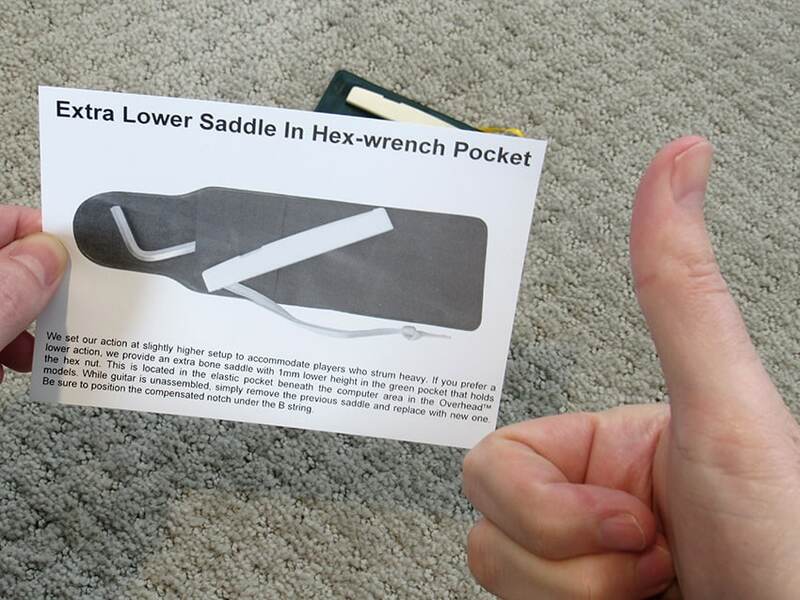 The lower action saddle is included in the sleeve that also contains your truss rod wrench. Now the fun part. I’ve shown you the gig bag, extra saddle, and truss rod wrench already, but let me backtrack a bit and do a proper unpacking sequence. 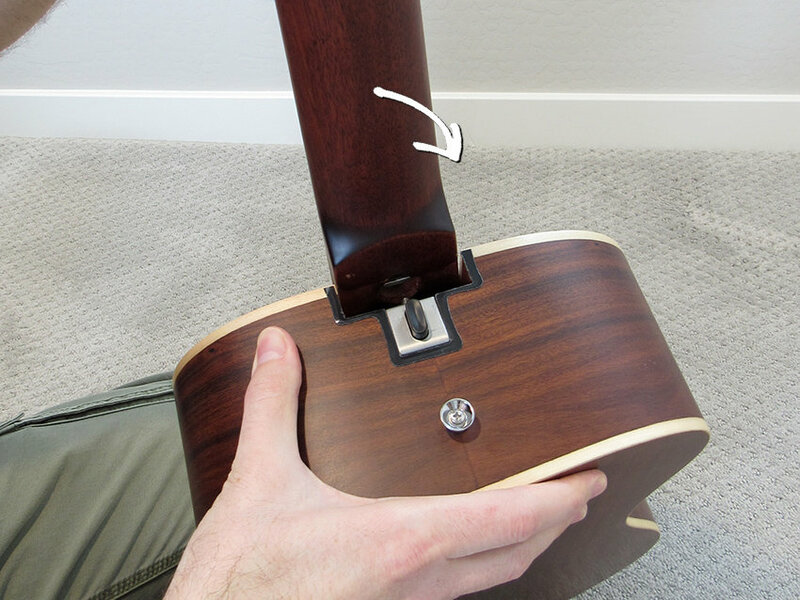 Then, I’ll show how you attach the neck as well as some other interesting features of this acoustic travel guitar. 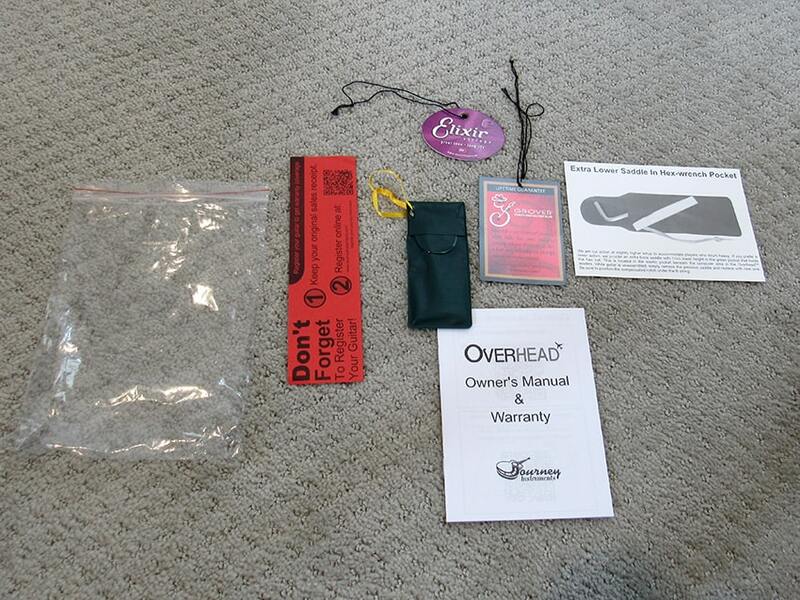 Accessories, tags, and manual laid-out. The snugly packed body and neck. Neck compartment keeps the neck safely away from the guitar’s body. 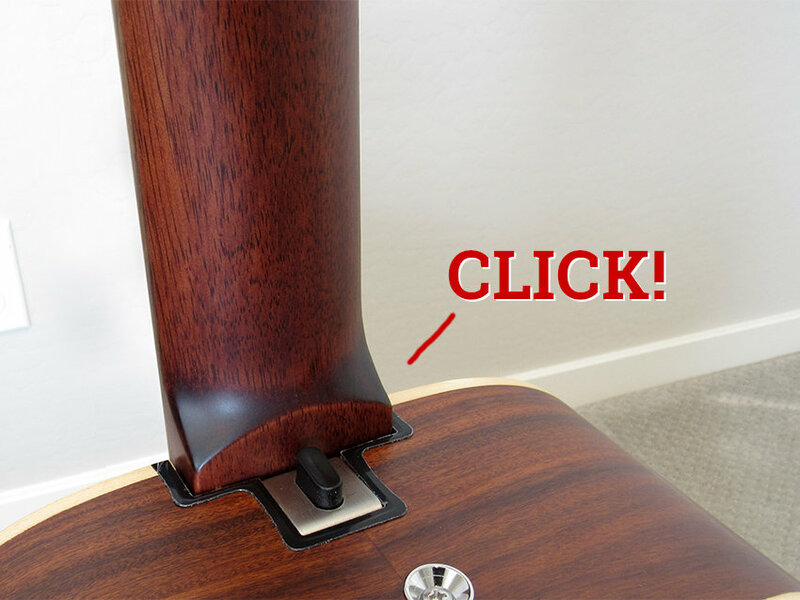 This flap prevents the strings from scratching the guitar’s body. The Journey OF420 body and neck are out and now ready to be assembled. The neck joint mechanism of the OF420 might look a little intimidating at first, but don’t worry, attaching the neck is quite easy. However, I do encourage you to read the instruction manual first. I’ve seen a few YouTube videos where the reviewers didn’t follow the proper procedure for safely attaching the neck. Gotta love the Internet. What’s the plastic stuff around the neck pocket, you ask? 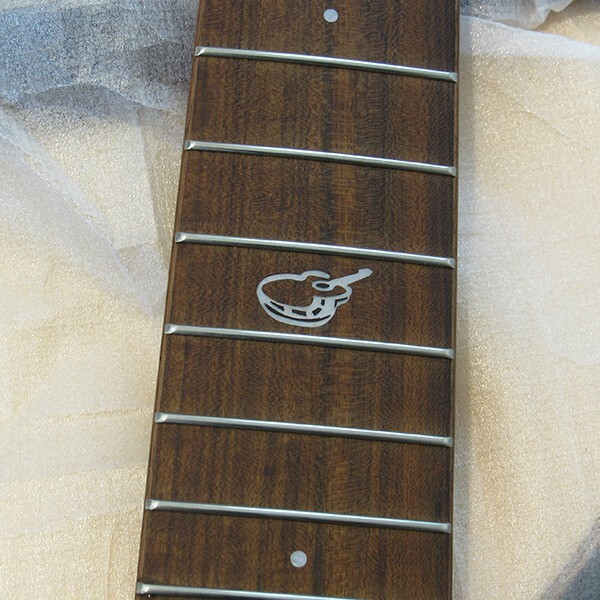 It’s a scratch protector… for those who tend to be a bit rushed or careless when inserting the neck. You can remove it if you wish. 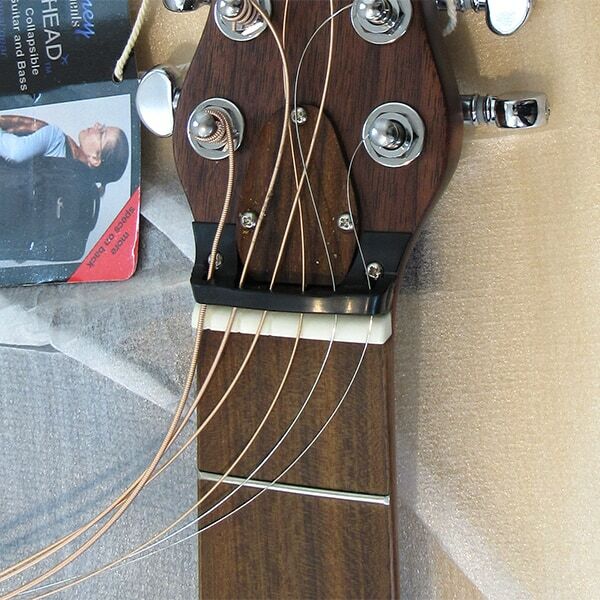 First, make sure the strings aren’t twisted before placing the neck in the pocket. 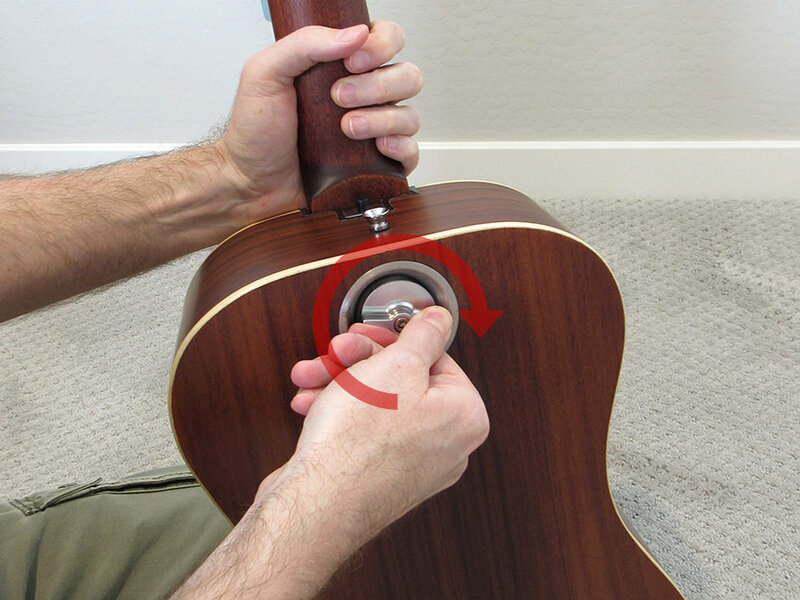 The manual recommends you gently hold the guitar body between your knees (without squeezing the body too tightly). You can do this sitting in a chair, but since this guitar was loaned to me by Journey, I took the extra precaution of being on the soft floor. There’s a metal lip in there that helps guide you in. Just place the front bottom edge of the neck in the pocket, and then gently lever it backward into the pocket to close the gap. When it’s home, you’ll hear a satisfying “click!” At that point it’s secure in the pocket–but you’re not quite done yet. You need to now turn the little lever clockwise to fully secure it in place. Turn it until it’s a bit more than finger tight, but do not crank on it past this point. It doesn’t need to be ultra-mega-tight. 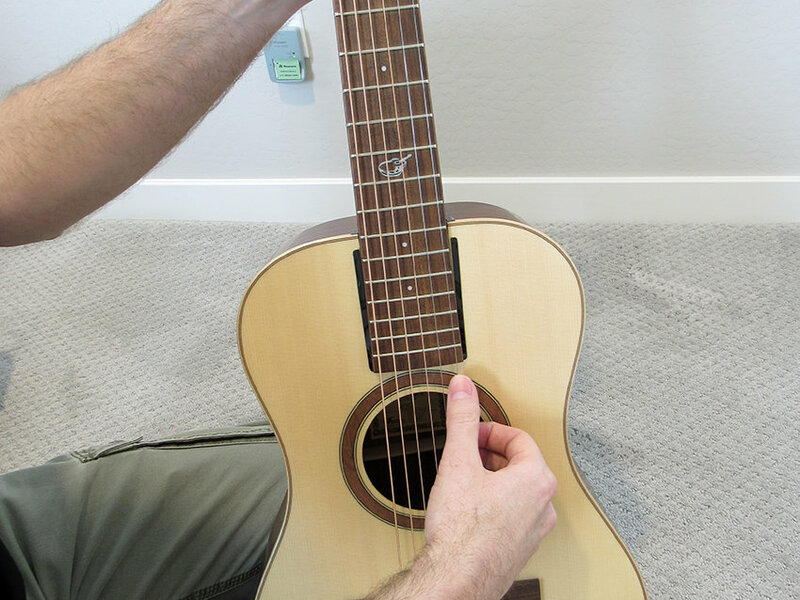 The very last thing that Journey recommends is giving the strings a gentle tug to take up any residual slack on the tuning pegs or at the bridge. This isn’t the kind of “stretching” you’d do for a brand new set of guitar strings. You’re simply eliminating any extra slack that resulted from the neck being detached. After giving each string a little tug, tune it up and start jamming. One interesting note: in my experience, the OF420 was basically in tune whenever I re-attached the neck, which was totally unexpected and pretty cool. I took a ton of photos of the OF420, so before I get into the detailed ratings and demos, I wanted to post a few more shots of the OF420. The OF420’s detachable neck makes all the difference here. When I first saw it, my initial concern was intonation. However, I was pleasantly surprised to find that the intonation was just as accurate as any other acoustic guitar with a glued-in neck. 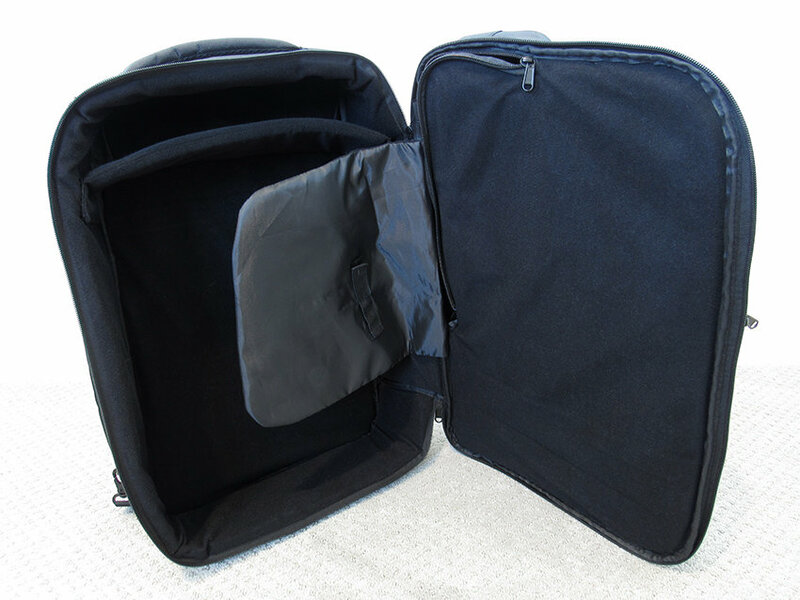 Add the included convertible gig bag to the mix and the Journey OF420 easily earns a full 5 stars for portability. You may be wondering… why only 3.5 stars here? It’s not because the OF420 is fragile, or because something is wrong with it. It’s because this is an all-wood guitar, and therefor it needs to be treated with the same common-sense respect you’d treat any wooden acoustic guitar. The only time I’d give ANY guitar more than 3.5 stars in this category is if it were made from some highly durable, non-wood material like carbon fiber. Note that the scale length of the Journey OF420 is a tad shorter than average at 24.5 inches. To me, this was perfectly fine and the neck played very comfortably. However, if you have really large hands or fatter fingers, you might find the neck a little tight. Otherwise, the OF420 was a joy to play, and the “lower action” saddle brought the strings much closer to my desired string height. I could’ve easily brought the action lower by filing-down the bridge saddle a bit, but since this guitar was a loaner I didn’t want to permanently modify it. For a small-bodied travel guitar like this, the acoustic sound was great. If you’ve never played a smaller guitar or a travel guitar, it’s important that you have the right expectations. 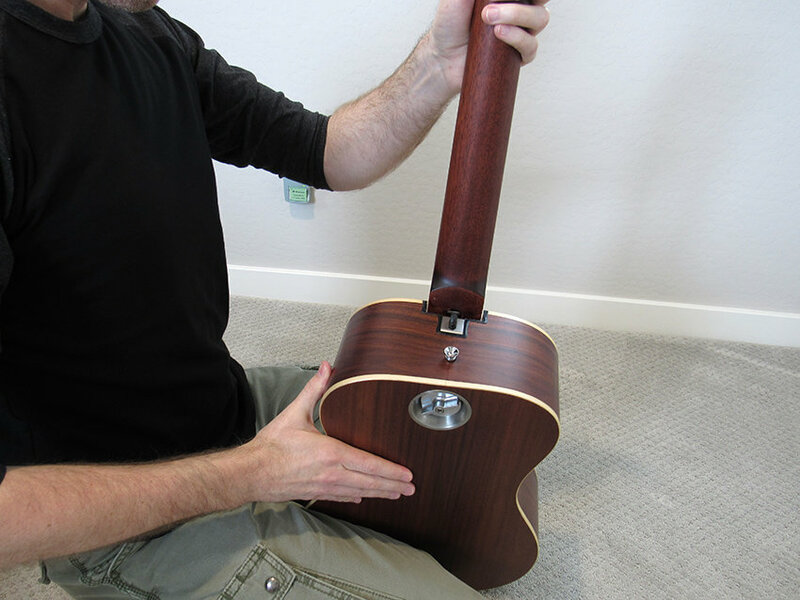 Travel-sized acoustic guitars don’t sound as big as full-sized acoustic guitars. That’s just physics. So, that’s why I say this guitar sounds great “for a travel guitar.” Where I was really surprised was with the passive transducer pickup. Because it’s passive (doesn’t require a battery) and didn’t include any EQ controls, I was skeptical, but pleasantly surprised at the good volume and balance across all 6 strings. In the “price” category, the fewer the stars the higher the price. 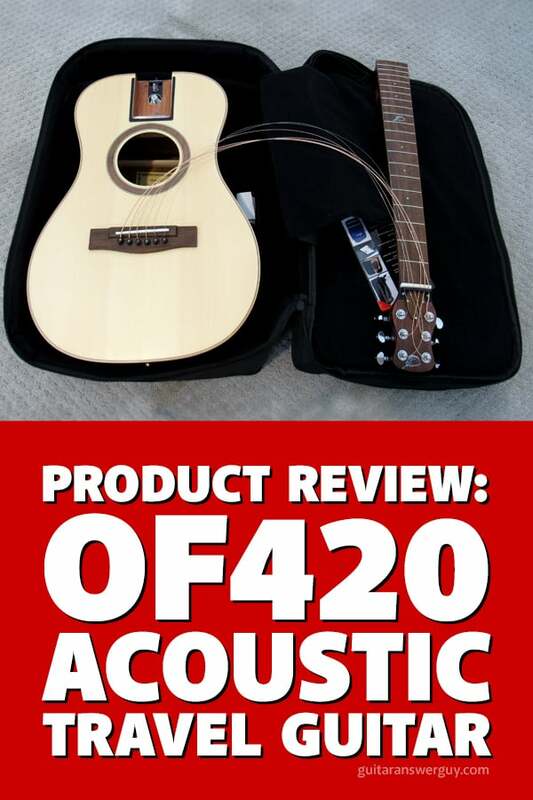 Indeed the OF420 is one of the more expensive acoustic travel guitars out there. However, I feel that the value is definitely there. This feels (and sounds) like a solid, high-quality all-wood acoustic guitar that’s going to last a lifetime if you treat it reasonably well. A detachable neck that is rock-solid and properly intonated when attached. A passive (no battery required) transducer pickup that sounds surprisingly good. 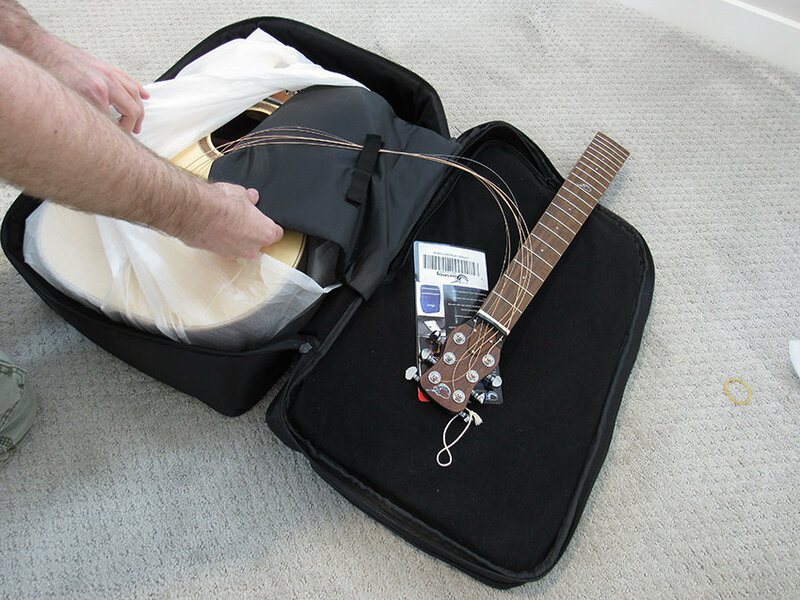 The acoustic sound is really good for a travel-sized guitar. 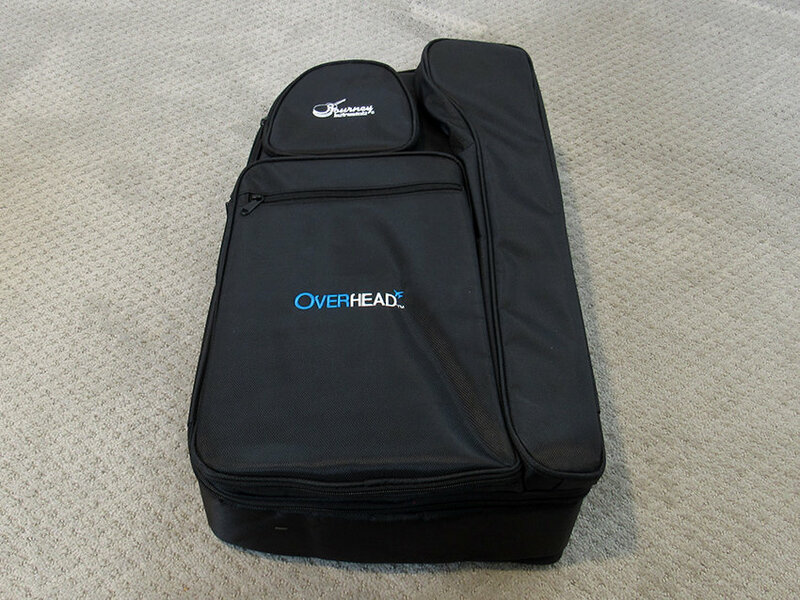 Comes with a nice gig bag that can be carried by hand or converted into a backpack. It’s not cheap. 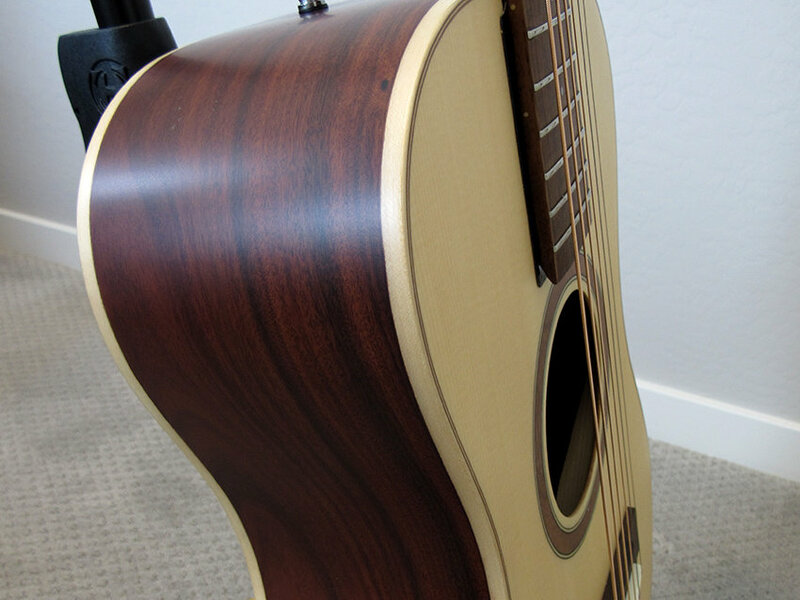 Compared to other “travel” acoustic guitars, this one’s on the high end of the spectrum. 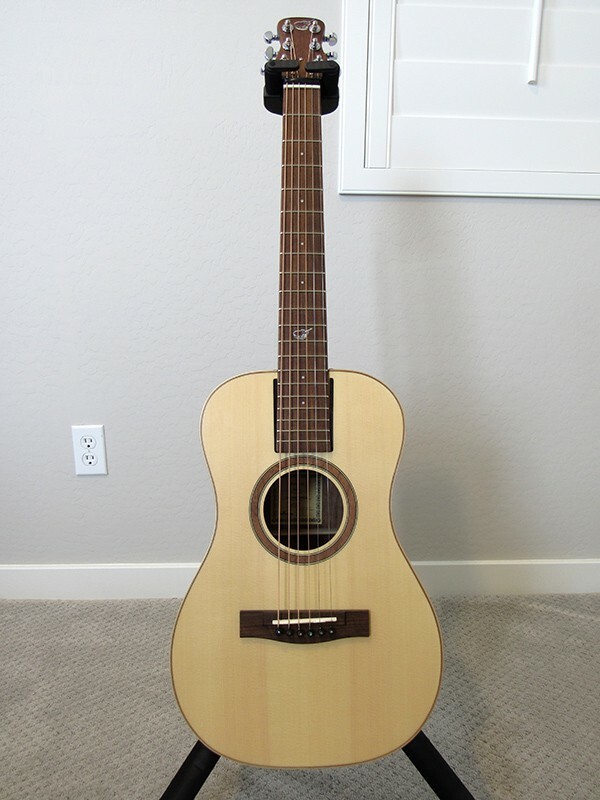 If you’re looking for a high quality, all-wood acoustic guitar that is capable of collapsing as small as possible, it’s hard to imagine a better guitar than the Journey OF420. For its size, it has a relatively rich, deep sound. 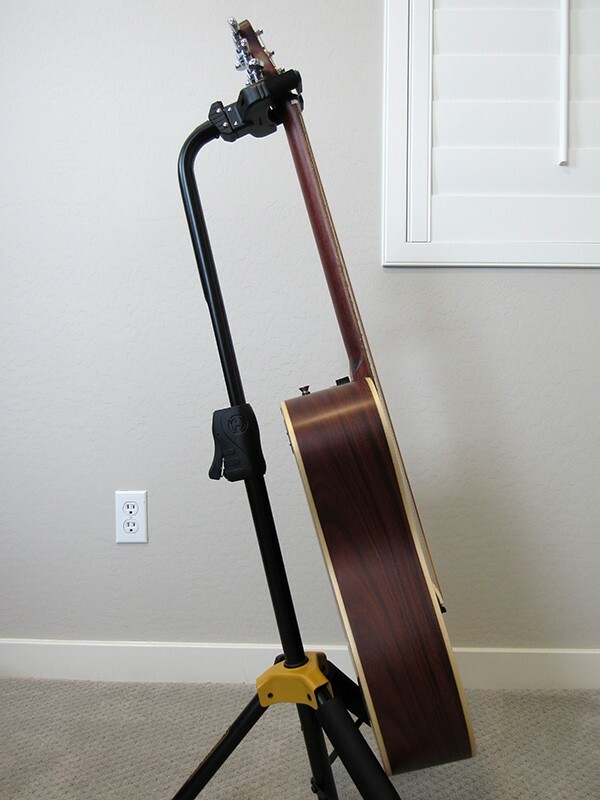 Whether you just want a travel acoustic for fun, or you’re a busker or stage performer, I’m confident the OF420 would excel in any of those situations.